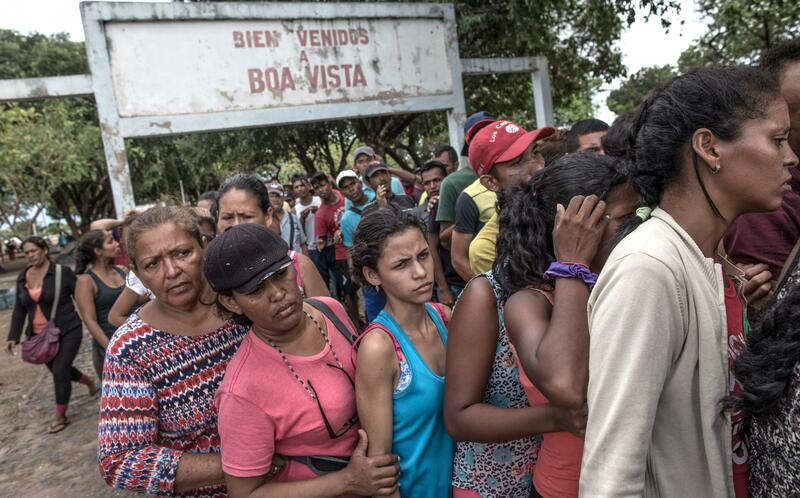 Venezuelans wait in line for food in northern Brazil in February 2018. The migrants often say the main reasons they've fled are to get food and health care. Statistics that have come out show that all the basic parameters of health in Venezuela have been moving ominously in the wrong direction for the past decade. Rates of malnutrition and HIV are rising; there are new outbreaks of preventable diseases like diphtheria. Infant mortality, which García has been tracking, is on the rise. García and her colleagues just published a study on rising infant mortality in Venezuela in the journal Lancet Global Health. "But the mortality estimates [from the government] haven't been updated or publicly available since 2012," she says. So García and her colleagues had to piece together infant mortality estimates from census data and hospital death reports. Infant mortality, the death rate for children under age 1, is widely viewed as a barometer of a nation's overall health. García's study found that the infant mortality rate is now 21.1 deaths per 1,000 births, up from 15 deaths per 1,000 births in 2008. That's far above the average infant death rate for Latin America and comparable to the country's infant mortality rate in the 1990s. "This is shocking," she says. "I mean, we have lost 18 years of progress in infant mortality. It is shocking." It's shocking for many reasons. First, Venezuela is a relatively rich nation. It has the largest oil reserves in the world. (Yes, even more than Saudi Arabia!) Twenty years ago, President Hugo Chávez promised free universal health care in the South American nation and made significant strides toward delivering it. In 2010, the United Nations announced that Venezuela had met most of the Millennium Development Goals — a set of measures for basic social progress. The country slashed its extreme poverty rate from 30 percent of the population in 2003 to 7.2 percent in 2009. The Chávez administration wiped out measles in 2007 through a nationwide vaccination campaign. People with HIV got anti-AIDS medications for free through the public health care system. From a public health perspective, Venezuela's future was looking bright. But now under an economic and political crisis that started in the late 2000s and has worsened since Nicolás Maduro became president in 2013, all of that has changed dramatically. Last year, hyperinflation zoomed to somewhere between 80,000 percent and 1 million percent, depending on whether you go with the estimate from a Forbes article or the International Monetary Fund's estimate. Millions of Venezuelans have fled the country since Maduro took office. Late last year, Dr. Kathleen Page, an infectious disease specialist at the Johns Hopkins School of Medicine, visited border towns in northern Brazil that are now hosting tens of thousands of migrants. Page, who is originally from Uruguay, says the local Brazilian hospitals are overwhelmed with incredibly sick people. In the HIV wards, she felt as if she were stepping back in time to the early days of the AIDS crisis. "I was not a doctor in the 1980s when the AIDS epidemic started. But I know what happened, and I felt that in these wards I was going back to the 1980s," Page says. "People were basically dying of opportunistic infections. They were emaciated, dying of chronic diarrhea, infections in their brain — things that we know are treatable and preventable. And to give credit to the Brazilian doctors, they were doing everything they could to help people, but the hospitals were at capacity." "I interviewed over 100 people crossing the border, and I would ask them, 'Why did you come?' " she says. "Ubiquitously the answer was food or health care." Many people told her they'd been surviving for months in Venezuela on a diet only of yucca, a rugged shrub that has a potatolike root. The resurgence of measles is another sign of the country's backsliding in public health. After having wiped out measles more than a decade ago, last year the country was hit by a major outbreak of the disease that has sickened more than 9,000 and, according to the U.N., resulted in the death of at least 74 Venezuelans in 2018. Officials with the Pan American Health Association have also linked measles outbreaks in nine other countries in the region to strains of the virus circulating in Venezuela. "One of the things that I think is notable," Page says, "is that Venezuela had made incredible progress in terms of many of the public health markers that we care about. Infant mortality, maternal mortality, malaria control — all these things had really gone in the right direction for Venezuela for many years, and then starting in the late 2000s things started to decline." Now, she says, the health care system in the South American nation has completely collapsed. Page says Venezuelan patients she met at the border with Brazil told her that the hospitals in Venezuela had run out of all the most basic supplies. Some no longer had running water or electricity to sterilize equipment. "It was really shocking talking to these patients," Page says. Patients who needed medical care were told by the hospital staff that they had to find all their own surgical supplies. "You have to buy your own gloves; you have to buy your own syringes. You have to bring everything in," Page says. "But even buying gloves and syringes becomes impossibly expensive because of inflation in the black market." Page was really struck by one mother who had just come out of Venezuela with her 10-year-old daughter. The girl was in a wheelchair and needed a catheter. "They had been using the same catheter for a year. These catheters are supposed to be changed every time you use them," Page says. The girl had developed a kidney infection, and they couldn't get any antibiotics. "So they actually pushed her 200 miles across the border," she says. Two hundred miles on foot for a catheter and some antibiotics. Page says the health conditions she saw among the Venezuelans were startling, particularly given Venezuela's reputation as a relatively wealthy Latin American country. And these migrants weren't fleeing a war zone. "The devastation that you're seeing is not war. It's mismanagement, poor economic decisions. It's corruption," she says. "There is a lot of complicated factors, but it's totally man-made." Here's one sign of how deep the crisis in Venezuela. Its health care system has collapsed. Regional officials say a measles outbreak that began there was not controlled. It's now spreading throughout South America, and some basic medical supplies and medications, even surgical gloves, are no longer available in clinics in Venezuela. NPR's Jason Beaubien has more. JASON BEAUBIEN, BYLINE: By just about every measurement possible, Venezuela's once impressive medical system has fallen apart. The Latin American nation with the largest oil reserves in the world is now dealing with an ongoing measles outbreak that last year sickened thousands of people and killed at least 74. Clinics have run out of basic surgical supplies and antibiotics. Routine vaccination campaigns have been suspended. Even patients dependent on lifesaving HIV medications have seen supplies of their anti-AIDS drugs disappear. Dr. Kathleen Page recently visited camps in northern Brazil for some of the 3 million Venezuelans who fled the country. KATHLEEN PAGE: It was not a doctor in the 1980s when the AIDS epidemic started, but I know what happened, and I felt that in these wards I was going back to the 1980s. BEAUBIEN: Page, an infectious disease specialist at Johns Hopkins medical school, says she was shocked to see AIDS patients from Venezuela dying of opportunistic infections. PAGE: Chronic diarrhea, infections in their brain, things that we know are treatable and preventable. BEAUBIEN: Page traveled to the Brazilian-Venezuelan border late last year as part of a fact-finding trip for Human Rights Watch. PAGE: I interviewed over 100 people crossing the border, and I would ask them, why did you come? And ubiquitously, the answer was food or health care. BEAUBIEN: Many people told her they'd been surviving for months on a diet only of yucca, a rugged shrub that has a potato-like root. In the late 1990s, Hugo Chavez promised free universal health care in Venezuela, and the country quickly met most of the U.N.'s health care targets by 2010. But since then, the country's much vaunted health care system has collapsed. Infant mortality, the rate at which kids under the age of 1 are dying, is widely viewed as a barometer of a nation's overall health. A recent study in Lancet Global Health found that the nation's infant mortality rate has risen all the way back to where it was in the 1990s. Jenny Garcia is one of the authors of that study. JENNY GARCIA: This is shocking. I mean, we have lost 18 years of progress in infant mortality. It's shocking. BEAUBIEN: And kids are suffering and dying from simple things. At the Brazilian border, Dr. Page met a woman and her 10-year-old daughter who'd just come out of Venezuela. The girl was in a wheelchair and needed a catheter. PAGE: They had been using the same catheter for a year. These catheters are supposed to be changed every time you use them. And now she had an infection that was affecting her kidney, and there was no antibiotics. So they actually pushed her, you know, 200 miles across the border. BEAUBIEN: Two hundred miles on foot for a catheter and some antibiotics. Page, who is originally from Uruguay, says the health conditions she saw among the Venezuelans were startling, particularly given Venezuela's reputation as a relatively wealthy Latin American country. And these refugees weren't fleeing a war zone. PAGE: The devastation that you're seeing is not war. It's mismanagement. It's poor economic decisions. It's corruption. There's a lot of complicated factors, but it's totally manmade. This is not a natural disaster or something that was inevitable. BEAUBIEN: And that makes the Venezuelan health crisis, she says, even more disturbing. Jason Beaubien, NPR News. 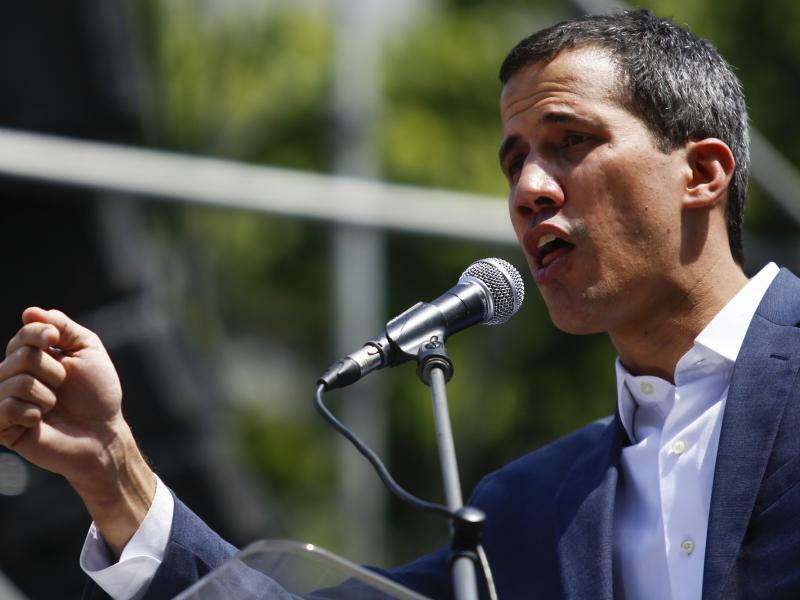 South Florida Democrats said Monday the U.S. must increase pressure on the Venezuelan government to end a devastating humanitarian crisis that has forced millions of people to flee the country. Rampant inflation and corruption has left Venezuela with dire shortages of food, water, medical supplies and electricity. During a roundtable discussion with Venezuelan community activists in Sunrise, Rep. Debbie Wasserman Schultz said the U.S. has given the crisis limited attention. 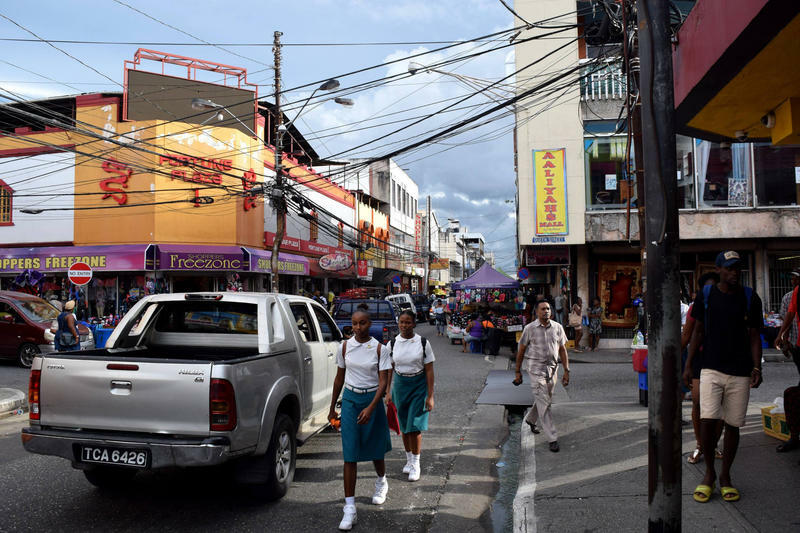 When Reyna Cumberbatch climbed out of a boat and onto a deserted beach in the Caribbean twin-island nation of Trinidad and Tobago, she was nervous but deeply relieved. Back in her home country of Venezuela, Cumberbatch, 23, had been worn down by hyperinflation, street crime and the daily struggle to eat in a country with chronic food shortages. She says the last straw was the cancellation of her computer programming classes at a technical school after nearly all of the professors emigrated.